While bankers do control the issuance of credit, they cannot control themselves. Bankers are the fatal flaw in their deviously opaque system that has substituted credit for money and debt for savings. The bankers have spread their credit-based system across the world by catering to basic human needs and ambition and greed; and while human needs can be satisfied, ambition and greed cannot-and the bankers’ least of all. I have a bad feeling about what’s about to happen. The Great Depression is the closest that comes to mind. I, like most, was not alive during the 1930s when it happened. Nonetheless, what once was feared in private is now being discussed in public. It’s going to be bad. It’s going to make high school seem like fun. This Time is Different: A Panoramic View of Eight Centuries of Financial Crises by University of Maryland‘s Carmen Reinhart and Harvard’s Kenneth Rogoff makes for perfect reading when flying between the US and Argentina. There is perhaps no better analysis than Reinhart and Rogoff’s on the history of sovereign defaults; and, as such, Reinhart and Rogoff’s paper was ideal reading material when traveling between the US and Argentina, for the sovereign defaults that happened in the past to Argentina will soon be happening to the US. But a US default will make Argentina’s debt defaults pale both by comparison and consequence. The US, unlike Argentina, is the world’s largest economy, the issuer of the world’s reserve currency and the world’s largest debtor-and a default by the US on its debt will shake the very foundations of our increasingly fragile global economy. The power of ambition is extraordinary. The power of ambition transformed the US from the world’s only creditor after WWII into the world’s largest debtor in less than fifty years. Wanting to emulate England’s 19th century empire in the 20th, the US instead has mirrored England decline in the 20th century here in the 21st. Credit and borrowing fueled America’s ambitions in the 20th century as it had England’s in the 18th and 19th. During the 1980s, to pay for President Reagan expansion of the military, the US quadrupled its national debt in less than a decade by borrowing three trillion dollars during a presidency pledged to balance the budget. When Reagan took office, US debt totaled one trillion dollars. When Reagan left office, US debt totaled four trillion dollars. Reagan’s vaunted slogan of fiscal conservatism was just that-a slogan; and while talk is cheap, the debts now have to be repaid. Ambition has its price and the bill is now due and owing. The question is: how will the US pay what it owes? In Hyman Minsky’s Financial Instability Model, the US is close to “Ponzi status” if not already there since the US is having to roll its debt forward and borrow from others to pay the interest as it can no longer pay down the principle. In 2006, in an article published by the St Louis Federal Reserve Bank, Professor Laurence Kotlikoff stated the US was “technically bankrupt” as there was no way the US could pay the $65.9 trillion it owed. Evidently, Professor Kotlikoff was conservative in his estimate or we’re going downhill faster than he knew. Just three months ago, on May 28, 2008 Richard W. Fisher, President and CEO of the Dallas Federal Reserve Bank estimated the obligations of the US to be actually $99.2 trillion, 50 % higher than Kotlikoff’s figures. In the distance, I see a frightful storm brewing in the form of untethered government debt. I choose the words-“frightful storm”-deliberately to avoid hyperbole. Unless we take steps to deal with it, the long-term fiscal situation of the federal government will be unimaginably more devastating to our economic prosperity than the subprime debacle and the recent debauching of credit markets that we are now working so hard to correct. Fisher should know what the US owes and the danger that sum represents. As President and CEO of the Dallas Federal Reserve Bank, Fisher is a part of the Federal Reserve System-the very system that has indebted America into perpetuity when its credit-based money forced out gold and silver based money in 1913. But in his speech Fisher said nothing about the role the Federal Reserve has played in America’s fatal dance with debt, warning instead about the increasing costs of entitlements such as Social Security and Medicare. Fisher is part of a larger effort to now blame America’s entitlements as the primary cause of our problems, assiduously avoiding the role his own Federal Reserve Bank has played in sinking our once wealthy nation into perpetual indebtedness. In truth, the entitlement program that poses the greatest threat to America is-and always has been-the Federal Reserve System. Without the Federal Reserve’s credit-based money whose compounding interest (paid to the bankers) is obliged to be paid for by a possibly unconstitutional US income tax [note: the Federal Reserve Act and Federal Income Tax were both instituted the same year in 1913], the US would not be indebted and bankrupt as it is now. But, of course, they won’t and the now privately controlled US government will continue to indebt the American public so insiders can continue to profit immensely at the public trough. But the question still remains, how will the US pay its unpayable debt? The answer is as clear as it is obvious. It won’t because it can’t. In their well-researched paper, Serial Defaults and Its Remedies, Reinhart and Rogoff write “Cycles in capital flows to emerging markets have now been with us for two hundred years”. If we are to understand the dynamics of serial default, it would do us well to look at these cycles and their relevance to what is happening today. Serial Defaults and Its Remedies, Section 2. ..a pattern of borrowing followed by crisis is evident in the string of defaults during 1826-28 in Latin America that come on the heels of the first wave of massive capital flows from Britain into Latin America in 1822-25…A second wave of capital flows from Britain came during the 1850s and 1860s. The cycle ended with the crisis of 1873. The next wave of capital flows into emerging markets coincided with the shift of the financial epicenter of the world from London to New York. Among Latin American countries, the borrowing binge of 1925-28 was [financed] with “cheap” money from New York. Capital flows peaked in 1928, the year before the U.S. Stock market crash ushered in financial and currency crises around the world and eventually an international debt crisis during 1929-33. The British Empire was founded on the central bank invention of credit-based money and the subsequent ability to substitute this new “money” for costly gold and silver; and the issuance of paper money allegedly backed by gold and silver is a critical component in the confidence game of central bankers to pass off their printed coupons as the real thing. What the private bankers accomplished with the creation of the Bank of England was the government’s “legitimization” of the bankers’ new credit based coupons, sic paper money-coupons upon which the private bankers could now charge interest just as they had when loaning actual gold (what a wonderful scam). The new coupons were a lot easier to come by, especially when the king gave them a monopoly over its issuance. The advantage to the king was that the king now had an unlimited supply of “money” that could be used to finance his wars-wars which led to the establishment of the British Empire; the cost of which was transferred directly as a burden to the people as the new counterfeit debt-based money was now an obligation of the state, not of the king. The “capital” was really only credit, thinly disguised debt in the form of paper money originally issued by central banks, the Bank of England in Britain and the Federal Reserve Bank in the US, the twin towers of monetary Mordor. Lawrence Summers’ credentials as a banker are impeccable. Educated at MIT and Harvard in economics, Summers has served as Chief Economist for the World Bank, US Secretary of the Treasury and President of Harvard University. ..we are facing the most serious combination of macroeconomic and financial stresses that the U.S. has faced in a generation–and possibly, much longer than that…It’s a grave mistake to believe in the self-equilibrating properties of economies in the face of large shocks. Markets balance fear and greed. And when fear takes over, the capacity for self-stabilization is not one that can be relied upon. Lawrence Summer’s fears are not to be taken lightly. They are the banker’s equivalent of Jim Cramer’s televised fit of fear when interviewed on CNBC last year. While Summers is rightfully fearful of the current economic environment, the rest of us have far more to fear from bankers like Lawrence Summers and others like him. Summer’s role in the manipulation of the price of gold is found in his 1988 paper Gibson’s Paradox and the Gold Standard co-authored with Robert Barsky, published in the Journal of Political Economy (vol. 96, June 1988, pp. 528-550). The hubris of bankers such as Summers is stunning. Fixing the price of gold hoping to control interest rates and prices is like fixing the temperature of thermometers hoping to control global warming. Such is the short reach of Summers’ considerable intellect. Evil Bankers. Fact or Fiction? …developed countries ought to export more pollution to developing countries because these countries would incur the lowest cost from the pollution in terms of lost wages of people made ill or killed by the pollution due to the fact that wages are so low in developing countries…the economic logic behind dumping a load of toxic waste in the lowest wage country is impeccable and we should face up to that. As the World Bank’s Chief Economist, Summer’s memo is a chilling reflection of the heartlessness that lies at the core of bankers and banking establishments. The World Bank itself seems to be a favorite watering hole for those of questionable intent. Robert McNamara, the architect of the Vietnam War was President of the World Bank as was Paul Wolfowitz, the architect of the Iraq War. The current President of the World Bank, Robert Zoellick, is also an ardent supporter of the Iraq War (also on Zoellick’s considerable list of “credits” is his service as advisor to Enron, his membership on the Council on Foreign Relations and Trilateral Commission and his attendance at the secretive Bilderberg meetings from 1991 to the present and his role as Senior International Advisor to investment bank Goldman Sachs). It is no coincidence that those heading the World Bank are closely associated with America’s vast war machine. Bankers have profited from fueling the military ambitions of both England and the US for the past two centuries and continue to do so today. But perhaps the most damning indictment yet of the World Bank and today’s bankers is John Perkins’s Confessions of an Economic Hitman (Barrett Koehler, 2004) in which Perkins reveals the hidden intent of the World Bank and US bankers to cold-bloodedly indebt third world countries such as Argentina and profit by their misery. Perkins has just written a book, “Confessions of an Economic Hit Man” (Barrett Koehler, 2004). It is the War is A Racket for our times. Some of it is hard to believe. You be the judge. Soon after beginning his job in Boston, “I was contacted by a woman named Claudine who became my trainer as an economic hit man.” Perkins assumed the woman worked for the NSA. Perkins worked for Main from 1970 to 1980. His job was to convince the governments of the third world countries and the banks to make deals where huge loans were given to these countries to develop infrastructure projects. And a condition of the loan was that a large share of the money went back to the big construction companies in the USA – the Bechtels and Halliburtons. When a leader of a country refuses to cooperate with economic hit men like Perkins, the jackals from the CIA are called in. Perkins said that both Omar Torrijos of Panama and Jaime Boldos of Ecuador -– both men he worked with – refused to play the game with the U.S. and both were cut down by the CIA -– Torrijos when his airplane blew up, and Roldos when his helicopter exploded, within three months of each other in 1981. For years, Perkins wanted to stop being an economic hit man and write a tell-all book. He quit Main in 1980, only to be lured back with megabucks as a consultant. He testified in favor of the Seabrook Nuclear power plant (“my most infamous assignment”) in the 1980s, but the experience pushed him out of the business, and he started an alternative energy firm. While Reinhart’s and Rogoff’s work on sovereign default is worthwhile and important, their glaring avoidance of the geopolitical aspect of credit flows from England and the US to Latin America and other developing regions is indicative of the blind eye scholars turn to the activities of those who pay them. Lawrence Summers was President of Harvard University where Kenneth Rogoff is now employed. It is not likely those who hired the likes of Summers would look kindly upon Rogoff should he begin asking questions whose answers would lead to truths Harvard’s trustees would rather not see the light of day. But their “trained” eye wanders a bit, even to an untrained eye such as mine. According to Reinhart and Rogoff, the US is a “default virgin”, sic the US has never missed a debt repayment or rescheduled on at least one occasion. While this is strictly so, the US is nonetheless at the center of the largest default in monetary history. Of the US default on its gold obligations, Professor Antal Fekete wrote in June 2008. Thirty-five years ago gold, symbol of permanence, was chased out from the Monetary Garden of Eden, replaced by the floating irredeemable dollar as the pillar of the international monetary system. That’s right: a floating pillar. The gold demonetization exercise was a farce. It was designed as a fig leaf to cover up the ugly default of the U.S. government on its gold-redeemable sight obligations to foreigners. The word ‘default’ itself was put under taboo even though it punctured big holes in the balance sheet of every central bank of the world, as its dollar-denominated assets sank in value in terms of anything but the dollar itself. These banks were not even allowed to say ‘ouch’ as they were looking at the damage to their balance sheets caused by the default. They just had to swallow the loss, obediently and dutifully join the singing of the Hallelujah Chorus of sycophants in Washington praising the irredeemable dollar and the Nirvana of synthetic credit. Debt virgin? Hardly, and whether the US defaulted or not is not just a question of semantics, it is a matter of truth-which, like credit, is now surprisingly hard to come by. Carmen Reinhart and Kenneth Rogoff’s paper, This Time It’s Different, refers to the idea that sovereign defaults are a thing of the past. That we have somehow fixed what was wrong and it won’t happen again. Reinhart and Rogoff think otherwise. But this time, in a different way it really is different. This time default will come to both banker and debtor alike. The bankers’ system itself is now collapsing under the weight of debt that the bankers’ debt-based money has produced. Banks are finding themselves increasingly bankrupt as are the governments the bankers used to debase the world’s currencies. This time, not only will Argentina possibly suffer another sovereign default, so too will its creditor, the US, as will many of the US banks that issued that debt. Because of the enormity of the US debt, the amount of dollars necessary to print to pay down the debt will lead to the hyperinflation in the US and the destruction of the US dollar. Those who live by the sword sometimes die by the sword-though not often. The United States..appears to be running the same type of fiscal policies that engendered hyperinflations in 20 countries over the past century. Maybe this time it isn’t different..
At the time, Argentina’s external debt totaled $7 billion. When the bloody dictatorship ended with the return of democracy six years later, Argentina’s debt totaled $43 billion, a debt owed mainly to US banks. The common law concept of caveat emptor has particular relevance here, caveat emptor-Latin, “let the buyer beware”, is a legal precept that buyers must take responsibility for the conditions under which the sale was made. Richard Perle who supported the Iraq War said those words shortly after the US invaded Iraq. While it is doubtful Perle believes the same applies for debts incurred by the US supported dictatorship in Argentina, the truth of Perle’s words extend beyond Perle’s situational principles or a lack thereof. In a court of law, an illegal contract cannot be enforced-unless, of course, the court has been bought off. A critical distinction between the debt “owed” by Argentina and the debts owed by the US is that Argentina’s debt was illegally imposed upon Argentina by the IMF, the US and international bankers without the consent of the Argentine citizenry, The US debt, however, was incurred with the consent of the American people-or was it? While it is impossible for the debt burdened Argentines to do something about US banks, it is not impossible for Americans to do so. The US Federal Reserve Bank-the largest emitter of debt-based money in the world-while not an official US government agency is nonetheless still subject to the rules and laws of our land. It has been easy to manipulate those on the right as well as those on the left. The Republicans and Democrats have done so for years. But where’s the beef? The nation’s finances have been even more badly managed by the Republicans than the Democrats-and Iraq? Sure, vote for the Democrats and stay mired in a conflict they promised they would end. There is a reason why we are indebted as we are and there is a reason why we are mired in a war that one wants except the few that do, the few that now control our nation and many others. In the midst of this most unreasonable world, there are reasons-whether you want to know them or not. Humanity now finds itself at the beginning of a profound shift, a shift that will force us-if we are to survive, if we are to triumph-to put aside our differences to accomplish together what we obviously cannot accomplish apart. In college, I majored in political science with a focus on East Asia (B.A. University of California at Davis, 1966). My in-depth study of economics did not occur until much later.In the 1990s, I became curious about the Great Depression and in the course of my study, I realized that most of my preconceptions about money and the economy were just that – preconceptions. I, like most others, did not really understand the nature of money and the economy. Now, I have some insights and answers about these critical matters.In October 2005, Marshall Thurber, a close friend from law school convened The Positive Deviant Network (the PDN), a group of individuals whom Marshall believed to be “out-of-the-box” thinkers and I was asked to join. The PDN became a major catalyst in my writings on economic issues.When I discovered others in the PDN shared my concerns about the US economy, I began writing down my thoughts. In March 2007 I presented my findings to the Positive Deviant Network in the form of an in-depth 148-page analysis, “How to Survive the Crisis and Prosper In The Process.“The reception to my presentation, though controversial, generated a significant amount of interest; and in May 2007, “How To Survive The Crisis And Prosper In The Process” was made available at www.survivethecrisis.com and I began writing articles on economic issues. The interest in the book and my writings has been gratifying. During its first two months, http://www.survivethecrisis.com was accessed by over 10,000 viewers from 93 countries. Clearly, we had struck a chord and www.drschoon.com, has been created to address this interest. Lies that are told, Dummies that listen….. This country is in a red-level crisis of lies and deception, the enormity of which threatens to transform our country into something unrecognizable. We are being force-fed massive amounts of propaganda and outright fraud in nearly *every* aspect of our lives: politically, economically, socially, medically and even spiritually. The reason we created this blog was to try and expose the frauds foisted upon us and to share knowledge to counteract, as best we can, the deceptions we are expected to endure. It is a Herculean task, and we are but one tiny voice. Going against the main-stream media and it’s slick networks like CNN & Fox, etc. Is akin to trying to drain the ocean with a teaspoon; but the alternative – to know the truth and to say nothing, is morally repugnant to us. Pretty amazing is it not? 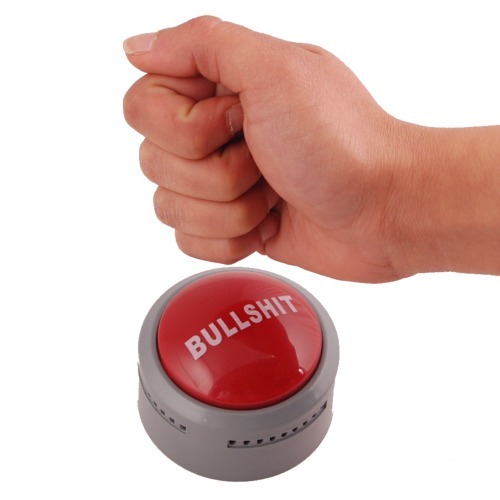 Just when you think that science understands that whole “Newtonian Physics” thing, they discover that the swift, perfectly symmetrical collapse of WTC Building 7 was caused “mainly due to fire.” Ahhh….. Dr. Shyam Sunder of the National Institute of Standards and Technology (NIST) your federal pension is assured! Why you will probably even get a raise! I am sure the money will assuage any guilt you might feel for abandoning all pretense of objective scientific investigation. Lets consider a slightly different explanation for WTC7 shall we? Wow…..a study shows organic foods do not have more NUTRIENTS than non-organic foods! Well DUH!! You don’t buy organic food because it is “more” nutritious, you buy it because it is not laden full of pesticides and herbicides!! The article does admit in one brief paragraph that the “study” made no evaluation on the merits of eating organic food versus food grown “conventionally” (i.e. with pesticides and herbicides). So apparently we will never know if eating your veggies dripping full of “Round-Up” and “Weed-be-Gone” is better or worse for you than veggies grown without. Yep, that will just have to remain one of life’s unanswered questions. In other news…..mercury is GOOD for you! 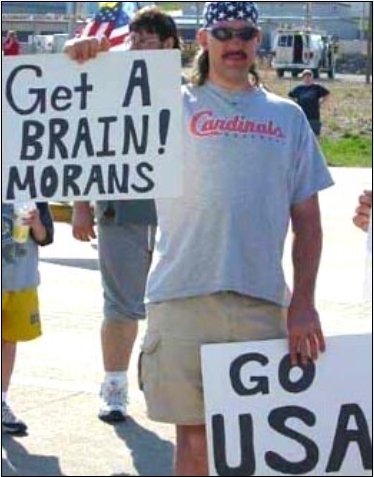 Bwahh ha ha ha ha ha….First the Govt said they took the mercury OUT of the vaccines. Now that a few people have caught on that it is still in the vaccines…they say it is GOOD FOR YOU! It helps children’s brains perform better! Mercury is one of the most toxic elements known to man. It damages the central nervous system, endocrine system, kidneys, and other organs. Mercury and its compounds are particularly toxic to fetuses and infants. Mercury exposure in young children can have severe neurological consequences. Here is a video of baby Paul. His mother might disagree with the premise that “vaccines with mercury “help – not hurt” children! The Elite at the top of the “pyramid” are also heavily inbred, deeply into the occult, and take pleasure in the suffering and evil they foist on the world. They are Luciferian. One of the key organizations, considered the “Spiritual Foundation of the United Nations” was originally called the “Lucifer Publishing Company”. However, the name “Lucis Trust” has been used from 1925. According to a statement on their website, the name “Lucifer” was used because, the founders considered Lucifer, the fallen angel, a positive principle; as did, also, Helena Blavatsky. We could give you thousands of additional examples….but in the interest of brevity, we will simply encourage you to *think* and *question* everything you think you know. Don’t be a dummy; don’t let them play you! This sums it up nicely! Insiders love bragging to one another about being on the inside– perhaps that’s one explanation for an abundance of illuminati symbolism in mainstream media and corporate logos. Among the interesting references to 9/11 that have been uncovered in media released before 9/11 is a passport for ‘Neo’ in blockbuster film The Matrix, released in 1999. 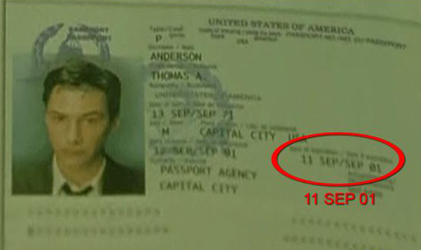 The passport– in Neo’s file– shows an expiration date of ’11 SEP 01,’ seemingly now an eerie coincidence found in the smallest of details. Further, the 10-year passport shows an issue date of ’12 SEP 91′– only one day after George H.W. Bush’s haunting September 11, 1991 speech before Congress where he called for, in no uncertain terms, a New World Order (and before that on Sept. 11, 1990) . Indeed, September 11 proves to be an important occultic date/number to the elites. Coincidence or not, the Wachowski brothers, the film’s directors, have proven to be obviously knowledgeable about a number of esoteric meanings– not only do both The Matrix trilogy and V for Vendetta contain plotlines laden with occult symbolism, but its imagery is also textured throughout these films. Such pre-9/11 coincidences are prevalent elsewhere in the media as well. 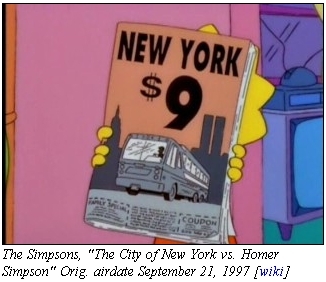 For instance, a 1997 episode of the Simpsons shows Lisa holding an ad for a $9 bus trip to New York with the towers interestingly juxtaposed next to the 9, portraying the image of 9/11. The pilot episode for ‘The Lone Gunmen‘ (an X-Files spin off) featured an extremely eerie plot where a government faction posing as terrorists hijack a 727 by remote control and attempt to fly it into the World Trade Center– the episode aired on March 4, 2001– some 6 months before the 9/11 attacks. The series’ star, Dean Haglund, has previously appeared on the Alex Jones Show to discuss the odd coincidence. “Part of the plot, as it said in the script was that this event would be used to start an international war on terror.” Haglund commented. Interestingly, Haglund also revealed that representatives of the FBI and NASA would frequently approach X-Files series creator Chris Carter with plots for stories and noted also that CIA and other government officials frequented Hollywood parties to plant script ideas. It is well-known that the Pentagon has a heavy influence in most big budget military films– trading access to bases, planes and other equipment for heavily influence and control of the message in scripts– and it is clear that such government forces meddle in other areas of media as well. Did Tom Clancy’s “lucky assertions” foretell the Georgian/Russian conflict and the SPP? Civil unrest in Russia in August 2008- Lucky guess? 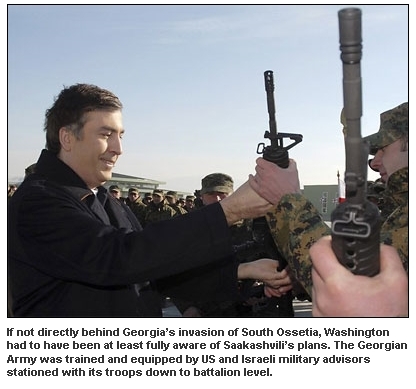 U.S. clandestine support of rebel factions in Georgia- Lucky guess? Specifically cites South Ossetia War in 2008- Lucky guess? The U.S. clandestine forces “Ghosts” are deployed in Ossetia to silence the rebellion – Lucky guess? U.S. Ghosts battle South Ossetian rebel forces from the north of Georgia. Russian government eventually sends in their army to aid the South Ossetian rebels – Lucky guess? There may in fact be more events which have yet to take place as this conflict in Georgia continues to unfold and how it may come to an end before more items of foreknowledge by Tom Clancy may be added to list above. But there is more…. Ironically or not, “The Security and Prosperity Partnership of North America (SPP),” which was predicated upon the writings of CFR members including Robert Pastor entitled “Creating a North American Community,” was agreed upon on March 23, 2005 by the heads of government, Mexico’s Vincente Fox, U.S.’s George W. Bush, and Canada’s Paul Martin launching the North American partnership (AKA: North American Union) at a meeting in Waco, Texas. Presumably, no one other than insiders had knowledge of the this agreement requiring Judicial Watch, a conservative public-interest law firm, to go through the Freedom of Information Act in Sep 26, 2006 to obtain the SPP documents (http://www.judicialwatch.org/5979.shtml). So, once again Tom Clancy got lucky in mirroring “The Security and Prosperity Partnership of North America (SPP)” during the developmental stages of this video game, “GRAW” in 2004 or earlier and months or may be an year prior to the actual consummation of the SPP agreement on March 23, 2005 Mexico’s Vincente Fox, U.S.’s George W. Bush, and Canada’s Paul Martin? Virtually two years or more before Judicial Watch obtained the documents in Sep 26, 2006? What odds would actuaries calculate on Tom Clancy “lucky assertions” in “Ghost Recon” 2001 video game about 1) the current conflict in Georgia seven (7) years prior to the actual event and 2) the mirroring of “The Security and Prosperity Partnership of North America (SPP)” with his supposed fictional agreement, North American Joint Security Agreement (NAJSA) close to one (1) year before the agreement took place and 3) two years or more before Judicial Watch obtained the documents in Sep 26, 2006? Tom Clancy’s wife second wife Alexandra Marie Llewellyn (26 July 1999 – present) is the niece of Colin Powell; as of 2001, Tom Clancy reportedly worth over USD $190 million http://www.imdb.com/name/nm0002007/bio. We have to ask…what reckless madness infects Israel & the Neo-Cons to want to “poke the bear” in such a blatant way? To what end does it serve? We have no love for Vladimir Putin and his corrupt regime, but for Georgia to launch a sneak attack, violating previous peace agreements and slaughtering ethnic Russians with the tacit encouragement of Israel and the US leaves us ill at ease. We believe this action is characteristic of the Illuminati’s favorite “modus operandi” which is “Ordo Ab Chao” or order out of chaos. Backing conflicts and wars is a very effective way to ensure a source of power and profits! 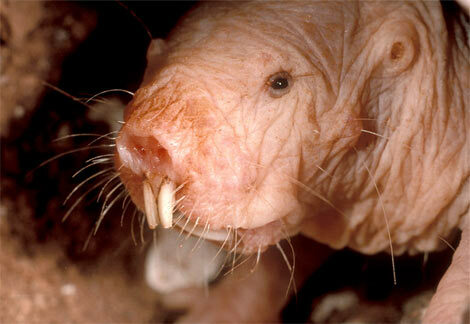 Anthrax Attacks – We smell a rat! Although we *should* breathe a collective sigh of relief that the notorious “Anthrax Terrorist” has finally been identified (forcing him to commit suicide of course); somehow a teensy bit of angst still remains. 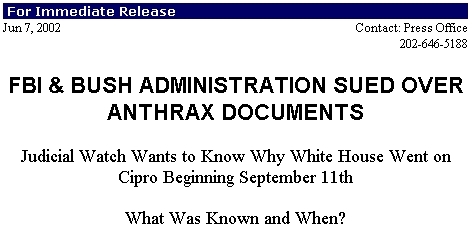 The 2001 anthrax attacks in the United States, also known as Amerithrax from its Federal Bureau of Investigation (FBI) case name, occurred over the course of several weeks beginning on September 18, 2001. Letters containing anthrax spores were mailed to several news media offices and two Democratic U.S. Senators, killing five people and infecting 17 others. The primary suspect was not publicly identified until 2008. In mid-2008, the FBI narrowed its focus to Bruce Edwards Ivins, a scientist who worked at the government’s biodefense labs at Fort Detrick in Frederick, Maryland. Ivins had been told about the impending prosecution and apparently committed suicide by overdosing on Tylenol with codeine as reported on August 1, 2008. 3) Why did the FBI focus almost all there attention on Dr. Steven Hatfill, when the case against him was so weak that the Govt. ended up paying him a 5.8 million dollar settlement? 4) Why is the case all neatly “solved” when there is significant doubt that the “target” Bruce Ivins was capable of the crime? On August 1, 2008 the Associated Press reported that Dr. Bruce E. Ivins, 62, who worked for the past 18 years at the government’s biodefense labs at Fort Detrick, had committed suicide. Ivins was a top U.S. biodefense researcher who worked at Ft. Detrick. It was widely reported the FBI was about to lay charges on him, however the evidence is largely circumstantial and the grand jury in Washington reported it was not ready to issue an indictment. Rep. Rush Holt, who represents the district where the anthrax letters were mailed, said circumstantial evidence was not enough and asked FBI Director Robert S. Mueller to appear before Congress to provide an account of the investigation. Ivins’s death leaves unanswered two puzzles. Scientists familiar with germ warfare said there was no evidence that Dr. Ivins had the skills to turn anthrax into an inhalable powder. According to Dr. Alan Zelicoff who aided the F.B.I. investigation “I don’t think a vaccine specialist could do it…This is aerosol physics, not biology“. The other problem is the lack of a motive. On August 6, 2008, federal prosecutors declared Ivins to be the sole culprit of the crime when Jeffrey Taylor, the U.S. attorney for the District of Columbia laid out the case against Ivins to the public. The main evidence is already in dispute. Taylor stated “The genetically unique parent material of the anthrax spores … was created and solely maintained by Dr. Ivins.” But other experts disagree, including biological warfare and anthrax expert, Dr. Meryl Nass, who stated: “Let me reiterate: No matter how good the microbial forensics may be, they can only, at best, link the anthrax to a particular strain and lab. They cannot link it to any individual.” At least 10 scientists had regular access to the laboratory and its anthrax stock, and possibly quite a few more, counting visitors from other institutions, and workers at laboratories in Ohio and New Mexico that had received anthrax samples from the flask. Dear Readers, doesn’t this all seem very very strange to you? Do you think it is *possible* that our loving Government is lying to us? Hhmmm??? I know, it is simply CRAZY to think that right? I mean, they have never lied to us about terrorism before have they? Bwahhaha hah hah hah hah hahahah………..